Dead Sea Minerals play a major role in the health of the body and skin by imparting a relaxed feeling, skin-nourishment and activation of blood circulatory systems. They are well known for their ability to stimulate healing process of wounds and skin rashes, refresh and rejuvenate the skin cells and ease rheumatic discomfort. The Dead Sea contains 21 minerals, including: Sodium, Magnesium, Potassium Bromide, Bitumen, Chlorine, Iodine, Calcium and Zinc. Such a high concentration is unique and exist only in the Dead Sea: it contains 10 times more salts and minerals than the Oceans. Twelve of the minerals existing in the Dead Sea are to be found solely there. The creams and lotions that contain these minerals are absorbed rapidly into the skin cells and keep the humidity lasting longer. The legend says that Cleopatra, the Queen of Egypt, who was known for her pampering beauty treatments, soaked her body in Dead Sea minerals bath. Vitamins are essential for the health of the skin: they reduce wrinkles and rejuvenate the skin, enhance water binding capacity, increased skin elasticity, acts as an antioxidant agent and protect and treat sun damaged skin. However, vitamin structure is not very stable and can be easily damaged as a result of oxidation or changes in the pH. To answer this challenge, Yaffa Zhav Skincare presents a unique and innovative method of preserving the vitamins in there perfect state and delivers it directly to your skin. Vitamin A, C, E, and co-enzyme Q10 are inserted to micro capsules which sustain and protect their functionality, stability and efficiency. The micro capsules technology isolates the vitamins and prevents diffusion into and out of the capsule, and controls the release – only upon application. The micro capsules come in varied colors, allowing you visualization of vitamin absorption into the skin! BLUE capsules contain VITAMINS A & E.
YELLOW capsules contain VITAMIN E & CO-ENZYME Q10. GREEN capsules contain VITAMINS C & E.
RED capsules contain VITAMIN E.
Vitamin E (Tocopherol Acetate) Protects the skin from premature signs of aging, rejuvenates of the skin, preserves the skin health, works as an anti-inflammatory and antioxidant agent. It enhances water-binding capacity and protects from environmental pollution (ozone-induced oxidative stress). Vitamin A (Retinol Palmitate) Enhances water binding capacity of the skin cells and therefore reduces wrinkles and rejuvenates the skin. Vitamin C (Ascorbyl Palmitate) An antioxidant agent which rejuvenates the skin, protects from sun damages and improves skin appearance by reducing fine lines and wrinkles. Co-enzyme Q10 Protects membrane lipids, act synergistically with vitamin E as an antioxidant agent, part of the inner mitochondrial membrane where it supports cellular energy production, supports the skin’s natural protection system, reduces wrinkles and rejuvenates the skin. 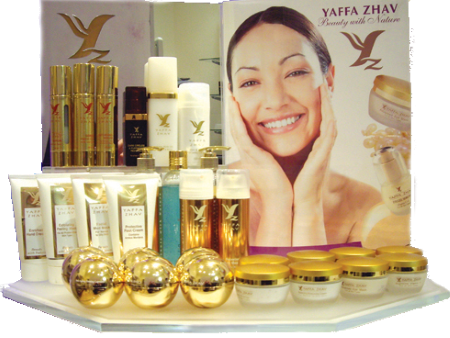 The Yaffa Zhav Skin Care range is recognised by the world’s leading beauty authorities as a major advance in beauty. One of its key ingredients, a SYNTHETIC PEPTIDE, won the 2006 Swiss Technology Awards. 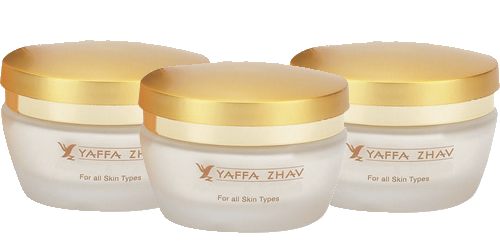 Five breakthrough formulae are at the heart of Yaffa Zhav Skin Care’s radical anti-ageing performance. is a synthetic peptide that mirrors the effects of Walgerin, an exotic but beneficial naturally occurring peptide. Clinical trials have proved its ability to reduce wrinkles through inhibiting muscle contraction. In fact trials have shown a 58% reduction of wrinkles over a 28 day application. – extracted from a unique natural algae considered to be a stress manager. PEPHA®-ACTIVE energises skin, stimulates the mitochondria (your skin cell’s energy centres), and boosts cell turnover and metabolism within the skin. – a patented method of synthesising peptides. SYN®-COLL stimulates collagen production via TGF (Tissue Growth Factor) with a proven, smoothing anti-wrinkle factor of as much as 350%. – extracted through biotechnology from micro algae and enhanced with polysacharides, PEPHA®-TIGHT instantly tightens the skin. Its Vitamin C and Vitamin B12 components also anti-oxidise and stimulate new cell formation. – formulated from isolated plant-based peptides, PREREGEN® protects the skin from environmental damage caused by ozone, smog, sun, cold, dry air and common airborne pollutant chemicals. Acting as a shield, clinical tests show visible improvement in firmness, reduction of superficial lines and increased skin moisture after just 8 weeks.